This lemon sherbet is so refreshing! Top it with blueberries for a sweet tart combination! This post may contain affiliate links. Summer is here. It’s 95 degrees today. While I approve of summer, I do not approve of 95 degrees. I would like my summer in the low to mid 80’s please. I’m hot (and not in the good way that makes men whistle at me) – I mean in the “I hate hot weather” kind of way. The only thing that makes it even bearable, besides gallons of sweet iced tea, is some sort of frozen dessert. What makes it even more bearable is some sort of frozen dessert that you can make within minutes of thinking of it, because you probably have all the ingredients you need in your refrigerator and pantry. Of course, I’m talking about something from my frozen dessert bible, The Perfect Scoop: Ice Creams, Sorbets, Granitas, and Sweet Accompaniments I wanted something quick and something that I could make without having to run to the store, because getting in my hot car was not an option. All you need is milk, sugar, and about 3 lemons! He has another version that uses buttermilk, but I didn’t have any of that, so I stuck with the basic formula. This was so good and refreshing! I topped it with some blueberries because blueberries and lemon is one of my favorite combinations. This is going to be my go-to treat this summer. This lemon sherbet is so refreshing. A wonderful combination of sweet and tart. In a medium, non-reactive saucepan, mix 1 cup of the milk with the sugar. Grate the lemon zest into the milk/sugar mixture. Heat, stirring until the sugar dissolves. Remove from the heat and the rest of the milk and the vodka. Chill thoroughly in the refrigerator. Stir the lemon juice into the milk. If it curdles, whisk it it vigorously. Freeze in your ice cream maker according to it's instructions. I love lemon and this sorbet look great. I always add a splash of vodka or rum to mine too, but I never thought of vanilla vodka. i bet that gives it a great boost of flavor! I adore lemon sherbet and your recipe sounds delicious. It’s the perfect summer dessert! Thank you for sharing it with us at the Hearth and Soul hop. i was definitely a fan of the orange ‘sherbert’ as a kid, but this is a batch for the adults! very lovely! Lemon Sherbert would have to be one of my favourites. Thanks for the tip about adding the vodka to keep it soft. I love lemon and I think the vodka trick is superb! I love sherbet! 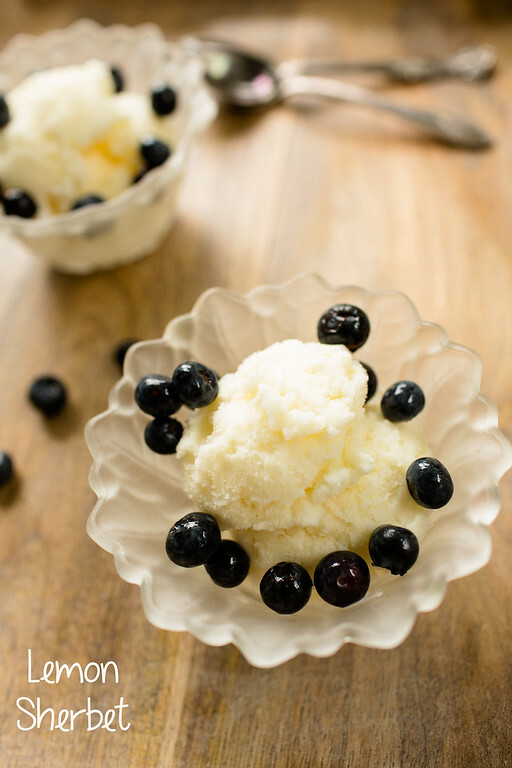 I’ve made my own lemon sherbet a time or 2, and it is a wonderful summer treat. Of course, I’ve never put the vodka in it, so that’s probably why mine is always too frozen! And I”m with you on blueberries being a great add-on with lemon. Well done, Pam, and I”m glad you’re enjoying your summer so far. Sherbets always feel so refreshing! Hope this cooled you down a bit!